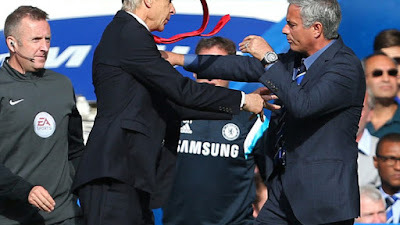 The manner in which Jose Mourinho has put behind the rivalry that existed between him and Arsene Wenger during their time in the Premier League is so alarming. The pair had it so tense probably because they coached teams in the same league thus causing a battle for supremacy. All that is now over as the two managers have since their departure from England made nice and soothing remarks to each other. Back in February at the Laureus World Sports Awards, Mou described Wenger as one of the best in history. The most recent one is also coming from the Portuguese who was full of praise for his French colleague in the course of a chat with bein Sport. “If we are talking about football, Wenger is the manager who coached the ‘Invincibles’. He won the Premier League with Arsenal without losing a single match and that remains through time.” Mourinho added. Wenger ended his reign of over two decades at Arsenal at the end of the 2017/18 season to be replaced by Unai Emery. As for Mourinho, a run of poor outings at Manchester United earned him dismissal from the club in December. Both of them are still on break from football management while hoping to resume shortly.